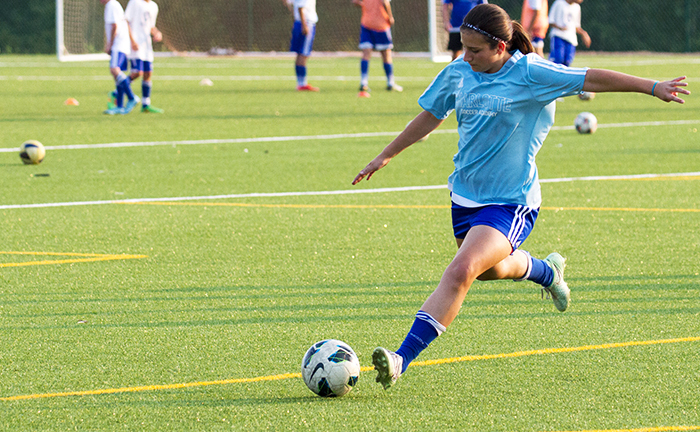 Carolina Sportsplex – Morrisville, NC. Matrix® Real is created with denser fibers and has a heavier pile weight which produces a longer lasting, more natural-looking synthetic soccer field turf that can withstand increased hours of play and practice time. This durable, resilient soccer field artificial grass has unparalleled cleat-turf interface for dribbling, breakaways, and sprints – three key components for any soccer field installation. Matrix Real also offers a slip-resistant but slide-friendly surface, providing players with stability while still offering flexibility of play. With virtually no “fly-out” from the turf, and predictable foot stability, Matrix Real is the top choice for your soccer turf installation. Combining Matrix Real with the eco-friendly Geo Plus infill will improve biomechanics and can result in decreased lower leg injuries for your athletes. This synthetic turf field is comparable to any well-maintained natural grass soccer field, without the level of high-maintenance. After the initial soccer field grass installation, Hellas will work with you to ensure that you know how to properly care for your turf, guaranteeing that your turf functions with the highest level of playability while maintaining aesthetics for years to come. Matrix Real comes in several color options, with the ability to add specialized logos to give unique touches to your new turf soccer field, and make your school stand apart from the competition. Each Matrix Real soccer field grass installation will be planned and constructed based on your specific needs and plan of use. 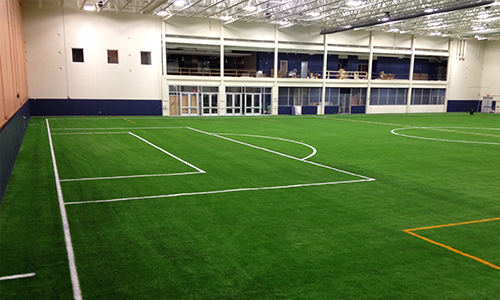 Romeoville Athletic Center - Romeoville, IL.